Botox is also known as Botulinum Toxin type A. When injected in very small amounts, it will result in relaxation of the involved muscles. This is useful for the treatment of wrinkles and hyper functional lines in the face. By relaxing theses muscles, other conditions such as blepharospasm and frontal dystonia, are also, quite effectively treated with this medication for up to 6 months in duration. Botulinum toxin also has the effect of blocking receptors in the parasympathetic nervous system which makes it beneficial in the treatment of migraine headaches. Botox can also be quite helpful for tension headaches due to clenching or stress. Often patients who are treated for wrinkles and fine lines will have the secondary benefit of treating them for headaches as well. It is important to understand what Botox will not treat. Botox will not fill in wrinkles, but helps resolve them by relaxing the muscles which cause the wrinkles and fine lines. 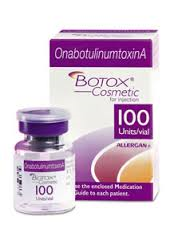 Botox also does not fill in the nasolabial folds, or smile lines. This requires the use of a filler such as Juviderm which is also available in the office, and can be used to prolong the effect of Botox in certain areas of the face. Are Botox Injections for you? A good understanding of the benefits, risks and limitations of Botox is important before proceeding with these injections. This will all be discussed during the consultation process with Dr. Robichaud. There are very few contraindications to Botox injections, apart from previous adverse reaction to the injections. If you have a medical condition for which the injections are indicated your insurance company may cover the cost of the drug, but there will still be an injection fee in most cases. The reason for the injections will be discussed during your consultation. In some cases, Photos will be taken depending on the reasons for your visit. For deeper lines it is often beneficial to add a filler 2-3 weeks after the initial Botox injections to achieve optimal results. For patients requiring Botox for medical reasons, you will have an appropriate general examination of the head and neck, ears, nose and oral cavity during your visit. A general questionnaire, which can be printed from this site, will also be completed to determine you overall health. When assessing for headaches, it is often necessary to obtain a CAT scan of the sinuses and Head to rule out infectious or other central pathology. Botox injections are quite easy to administer with very little discomfort. You should expect to return to your normal daily activity as soon as you leave the office. There can be very minor bruising afterwards in some occasions. It is important not to rub at the injected areas on the forehead for two hours after any injections in this area, as this can occasionally result in migration of the product into the upper lids which may produce temporary sagging, or ptosis, of the eyelids. The effects of Botox are temporary and will resolve in 4-6 months. If you have had a good result, it is important to book a follow up in that time period to maintain those effects. All patients are encouraged to book a three week follow up after the initial injection to see how you have responded, and in some cases, add further injections if needed.